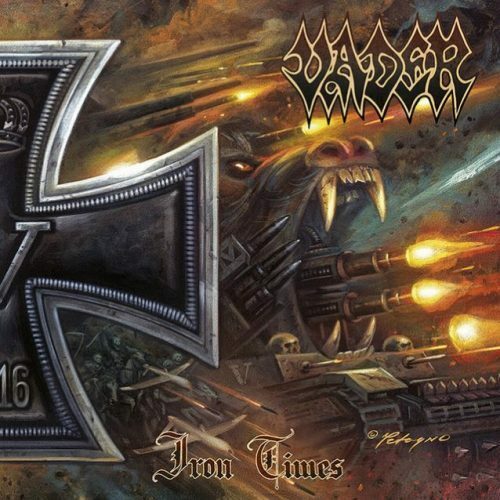 It’s not too often that we review an EP ahead of a full disc, but Vader’s Iron Times is one that I’ve been privately intending to get around to, especially since I would hazard to say that for metal fans, Iron Times really is a “fun” listen — and I’ll explain what I mean by that. Iron Times came out in Mid-August, which is about the time I got in my first listen, and with four tracks, two of which are covers, Iron Times is an unassuming release, one that is quietly understated with its album art — but the moment you press “play”, Iron Times tells a much faster, heavier story. However, it was Vader themselves revealing the album art to their new album The Empire, which is due out in early November, that triggered this review, especially since the two songs on Iron Times that are not the cover track or a brief Panzer X resurrection will be present on the full album. 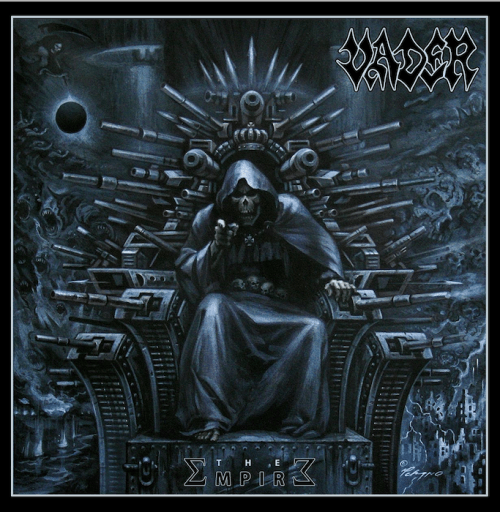 If we are to treat Iron Times as a preview of where Vader are headed in the future, combined with the cover art for The Empire and the music they packed into Future Of The Past II, I would guess that Vader are going to be leaning far harder into the thrash side of the genre descriptor than the death metal section. Iron Times is a quick listen; the two cover songs present are longer than the original material on this disc, and while Vader have shown time and time again that they can flip between some fast guitar riffing and huge blast sections at the drop of a hat, on this release Vader spend “Parabellum” and “Prayer To The God Of War” moving at a healthy clip with the classic one-two cymbal snare drumming. 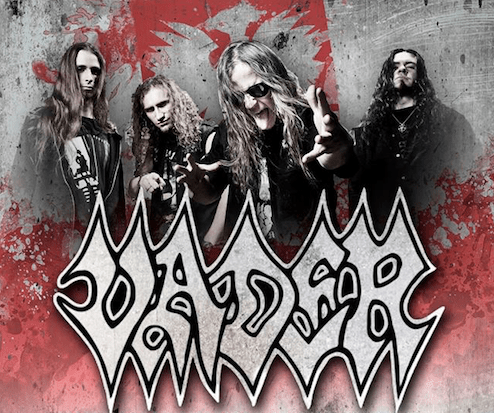 The Panzer X track and Motörhead cover, “Piesc I Stal” and “Overkill”, double the time of the two original tracks to bring the total of Iron Times to a whopping thirteen-plus minutes. It’s an EP that hits quick and gets out just as fast, starting out incredibly fast and then segueing into two interesting (albeit played remarkably straight) cover songs. As referenced before, “Parabellum” is the blunt ignition of Iron Times — the whole song starts out as just drums, but if you’ve been listening to metal then you’ll recognize that super-fast, thrash-metal drum beat, and then when the guitars kick in it becomes bleedingly obvious just how fast “Parabellum” is going to be. The blast sections in the song are brief, and the whole track is basically machine-gun guitar riffing from front-to-back. The brief solo that absolutely screams out of the guitar, like the song as a whole, is over before you know it. Vocalist Piotr bellows his way through the whole track, and the moment when the blast-sections appear, the whole song veers into death metal territory. “Prayer To The God Of War” is a more traditional thrash song with a heavy groove-focused bridge midway through. Most of it, though, is lightning fast, although it somehow manages to be longer than the previous track “Parabellum”. What makes “Prayer To The God Of War”, outside of its glorious shred guitar work, is the constant double-bass drumming, especially as the chorus builds up. The double-bass roll that leads to the end of the song is the perfect trigger for circle headbanging. If Vader had felt like changing the name of “Prayer To The God Of War” to “Circle Pit, You Pricks”, they would’ve been perfectly within their right to do so. Both of the original songs are giant mosh-pit battles, and I look forward to seeing the memorial walls to those who’ve fallen inside of them. “Piesc I Stal” is a mid-tempo, classically written metal song, built around a shout-chorus and a simple, chugging guitar riff. The song is one of the times on Iron Times when you feel a bit like you’ve stepped into a time capsule. If it weren’t for the lightning-fast pace of the two original tracks, you could absolutely credit “Piesc I Stal” as the reason why Iron Times feels like an EP built for the leather-vest and studs-wearing crowd. It’s also the only real slow track on this EP, because the cover of Motörhead’s “Overkill” is played remarkably straight — other than the thicker production style provided by Vader and the chunkier vocal work, “Overkill” is pretty recognizable. They haven’t fucked with Perfection, to say the least; it is literally “Overkill” through the lens of Vader, basically exactly as described. Which is also why the song is still one of the faster works, marked by the ceaseless bass-drum work that keeps the song propelled forward from brief guitar solo to brief guitar solo and the bridge, where it’s just the drums before the band comes tearing back in. Iron Times is one of the most blink-and-you’ll-miss-it releases that I’ve heard in some time. Vader start fast and end just as quickly. You’ll get constant repeats and loops back to “Parabellum” before you even notice, and to be fair, that’s not a bad thing either. The two original tracks on Iron Times are immensely heavy songs — gigantic pit-vortex-style tracks. Easily headbangable, and at two-and-a-half minutes each, they are just as easily consumed. The two cover tracks are fun in their own right, but the real meat is those two original songs — though I have a soft spot for “Overkill” in any form. As a brief teaser three months before the release of The Empire, Iron Times does an excellent job of whetting the palate for what will hopefully prove to be a delicious slab of red-meat guitar work and blast-heavy drumming.